Quality has improved dramatically at this estate, and the 2006 is a quintessentially elegant Bordeaux displaying a dark ruby/purple color, a lovely bouquet of forest floor, sweet cherries, cranberries, and black currants, medium body, a textured, sweet, tannic mouthfeel, and a long finish. Everything is beautifully pure as well as perfectly balanced in this outstanding effort. Anticipated maturity: 2010-2025. Excellent value. 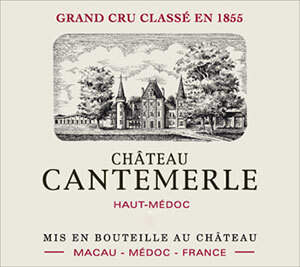 The 2006 Cantemerle was the "surprise package" of the blind tasting at Farr Vintners' horizontal. It has a conservative nose with rosemary and undergrowth scents that open nicely in the glass, but retain a sense of classicism. The palate is medium-bodied with grainy tannin, lightly spiced red berry fruit, sage and white pepper, quite persistent on the finish, which feels very pure. What an outstanding 2006 Claret - a Cantemerle that punches well above its weight. Tasted April 2016. Drink 2016-2030. Blackberry and sweet tobacco follow through to a medium body, with slightly aggressive tannins and a medium finish. Chewy. Needs time to mellow. Best after 2011. Deep red. Pure aromas of blackberry, violet and licorice, lifted by minty and herbal nuances. Juicy and energetic in the mouth, with spices and a light herbal quality contributing to the impression of lift and definition. Finishes with dusty tannins that seem a bit less gritty than they appeared to be a year ago from barrel. Very attractive with complex aromas and flavors of berry, mushroom and spice. Black truffle too. Full body, chewy tannins and a fresh finish. Very fine.